We know your biggest challenge as a Warehouse Operator is managing a safe and accurate warehouse with the lowest operating cost possible. The Slot3D™ Warehouse Model & Layout workflow is the most powerful tool in the industry. Simply enter general parameters about your storage equipment and watch as Slot3D effortlessly creates an intelligent and accurate 3D digital model of your warehouse. Powered by AutoCAD®, Slot3D combines your warehouse specific workflow rules with capacity and facility layout information from the 3D virtual model to develop economic based slotting plans. Give more attention to cost factors by studying alternative solutions on one model. Identify workflow bottlenecks and improve throughput. Standardize facility production increases through tested best practices. Understand the preferred path to maximize warehouse capital investment for DBOM (Design, Build, Own, Maintain). Simulate designs to improve the warehouse performance, rather than having to change an existing facility layout later. Quickly measure and design warehouse capacity. Experience the intuitive conceptual design workflow and benefit from the ability to make informed economic decisions. 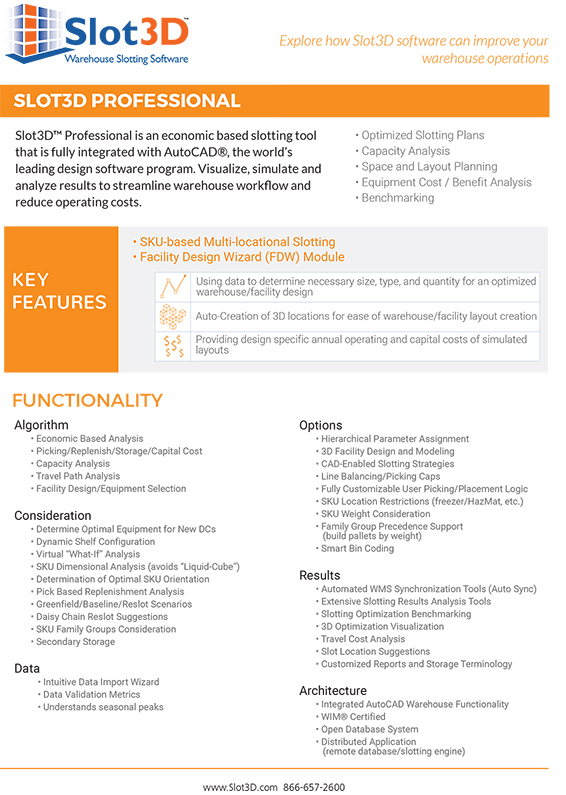 Slot3D™ is built specifically to help you design, visualize and optimize warehouse workflow by creating a digital model of your warehouse operations. Warehouse Owner Operators and 3PL's will be able to increase design and operational efficiency, when responding to changing warehouse requirements. Design and evaluate warehouse layouts that meet storage and distribution requirements and produce the best selection of type, size, quantity and equipment.